The two teams go head to head in Fortaleza on Saturday, having experienced vastly different fortunes in their opening games. 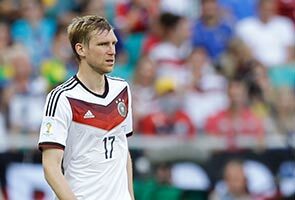 Per Mertesacker is expecting a physical encounter when Germany take on Ghana in their second Group G fixture of the FIFA World Cup. The two teams go head to head in Fortaleza on Saturday, having experienced vastly different fortunes in their opening games on Monday. Germany, among the pre-tournament favourites to lift the trophy come the final on July 13, were ruthless in brushing aside 10-man Portugal 4-0, with Thomas Muller scoring a hat-trick. Against the United States, meanwhile, Ghana recovered from Clint Dempsey's first-minute strike to equalise late on through Andre Ayew, only to concede a second to John Brooks shortly afterwards and go down 2-1. As a result, defeat on Saturday would leave Kwesi Appiah's men on the brink of elimination, a disappointing return given their stirring displays in South Africa four years ago, when they narrowly missed out on a semi-final appearance. And Arsenal defender Mertesacker, in line to earn his 100th cap should he feature against Ghana, anticipates their opponents to make their presence felt on Saturday. "They want to shine and excel in every one-on-one situation," he said. "I think the most important thing is that physically, Ghana are even stronger than the Portuguese. It'll be a fiery match, not least because of the heat in Fortaleza." Ghana captain Asamoah Gyan, meanwhile, called on his team-mates to show greater levels of concentration after conceding both early and late goals against the US. "We hope to be more focused in our next match," he said. "We've got time and we're professionals. "We need to sit down, take a long hard look at our errors and work hard. We have to regain our focus and not let nerves get the better of us. "It's going to be a difficult match but we need to stick together more than ever and play our game."